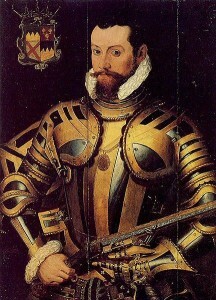 Thomas Butler, 10th Earl of Ormonde was born in 1531 in what is now the Republic of Ireland. He was the son of James Butler, the 9th earl and Joan Fitzgerald, who was the daughter of the Earl of Desmond. The Butlers had risen from being virtual unknowns to Earls of Ormonde, by virtue of being appointed chief cupbearer to the Lord of Ireland in the14th century. A century later, Margaret Butler’s marriage to William Boleyn meant that they would eventually be related to an English Queen Consort. When Anne Boleyn fell from grace, however, it didn’t appear to affect the family’s standing with the English King, as in 1544 Thomas left Ireland for London, having been granted a place at court. He was among a select group chosen to be educated with the future Edward VI and was the first Protestant member of his family. He succeeded as earl in 1546 after the death of his father and was knighted when Edward succeeded Henry VIII as King of England. Thomas showed himself as someone who could adapt well to the changing regimes in sixteenth-century England. He reportedly earned the nickname of ‘Black Tom’ while suppressing Wyatt’s rebellion in 1554. After the death of Queen Mary four years later her half-sister Elizabeth ascended the throne. Thomas was close to Elizabeth; she is said to have called him her ‘black husband’ and there is a persistent rumour that she bore him a son, Piers Butler of Duiske who was favoured in Thomas’s will, so much so that it was thought his mother was someone of great importance. Apart from the supposed dalliance with Queen Elizabeth I, Thomas married three times and had four legitimate children, as well as twelve illegitimate ones. Sadly, none of his legitimate sons lived long enough to inherit the earldom and on Thomas’s death the title passed to his nephew, John Butler of Kilcash. Thomas outlived Elizabeth I by eleven years, and died in 1614 in the Elizabethan manor he had built at Carrick-on-Suir. He had built the manor so that the Queen would have a suitable place to stay when she came to Ireland; sadly, she never visited. Thomas Butler, 10th Earl of Ormonde is buried in St Canice’s Cathedral in Kilkenny. I had barely heard of ‘Black Tom’ Butler until I visited Kilkenny Castle, and once I saw his picture I fell a little bit in love with him. He seems to have been a remarkable man. One of the things that I find most appealing about him is his adaptability; he was popular with Edward, fought for Mary and was close to Elizabeth and being in favour with all three rulers was something that not a lot of people managed. I don’t believe that Elizabeth had a child with him, but from all accounts they were close and they seem to have held each other in very high regard. I love the story of how he built the manor house for Elizabeth to visit. There is something very sweet about it, and even though I don’t believe that the two of them had a romantic relationship there seems to have been a real warm friendship there, and I’m glad that Elizabeth had someone like him around who genuinely cared for her and thought of her welfare. I have always thought it rather sad that Elizabeth chose to remain single and not marry. For many women marriage is not something they either want or need but in Elizabeth’s case I truly believe she feared marriage because of what she saw in her father’s marriages and in the execution of her mother and Katherine Howard. It is entirely understandable that she had deep seated fears; no child should be subjected to the cruelties she must have seen and heard in her father’s court and until she ascended to the crown I imagine she heard many cruel comments about her mother. Her birthday must have been bitter sweet to her; a day of celebration on one hand and a day of wondering if her mother would have lived had she been born a son for Henry VIII. Actually the Butlers did not spring from being ‘virtual unknowns’. Elizabeth’s grandfather, Thomas Boleyn, and Black Tom’s grandfather, Piers, vied for the vast lands of the Butlers for many years (as mentioned at the beginning of Wolf Hall by Hilary Mantel) as they were both considered heirs to the prestigious earldom of Ormond. Anne Boleyn returned to England with the sole purpose of marrying Black Tom’s father and ending the feud between the two families. This, of course, did not come to pass as Henry VIII got involved with Anne and gave the Butler titles of Earl of Ormond and Earl of Wiltshire to her father. However, Black Tom’s grandfather – a big mate of Wolsey – eventually recovered the title which Tom inherited. Why did Elizabeth call Tom …her black husband? The Butler family was far from obscure. The chief butlerage was to King Henry II, not a “lord of Ireland”. Black Thomas was 8 generations removed from King Edward I, his direct ancestor (through the Bohun family). The Butlers and the Geraldines (several FitzGerald families, mainly Desmond and Kildare) passed the rule of Ireland (for England) back and forth for generations. Thomas’ grandfather, Piers Ruadh, used an allegedly crooked court case to grab the earldom away from his older brother, Edmond of Neigham, by “proving” that Edmond and two other siblings were born before the legal marriage of their parents. His friends, including a priest, testified for him. Edmond was also married to a Geraldine, Ellyn. All of these people are my ancestors and I have studied them rather well. The Ormond Butlers, as well as the Dunboyne and Mountgarret llines, have been next to the Crown of England for centuries. This is all very interesting. My mother is linnea Butler and we have a big family! If you look up on Google Leigh Hunt’s Journal page 365, this person met royalty and noblemen and women and he described A LOT of them as having black complexions and brown, like black people of today. I am not racist nor trying to steal history. It is just that way too much history has been white washed and erased, because they do not want to reveal the truth. I have researched, reading Leigh Hunt’s Journal is a great place to start, today, I even found out Jane Austen was black. I hope that you do read the journal, instead, of saying I am wrong but why would a person from that time describe the people he came across as having black complexions if it was not true?